After I posted this banana-chocolate oatmeal on my Instagram stories last week, I asked out loud, “should I post this or not?” Silly question! I knew lots of you would want the recipe. Not that this is much of a recipe. I threw it together one day and then proceeded to make it virtually everyday for 2 weeks, I was so obsessed. To be fair, I did change up the toppings almost every time. But I am like this — I become addicted to a flavor, an ingredient, a dish and then I am happy eating it every day. Someone told me that highly successful people wear the same type of outfit every day. Why? Because it frees up their brains to think about other things and not waste time on what to wear. There are benefits to repeating recipes!! 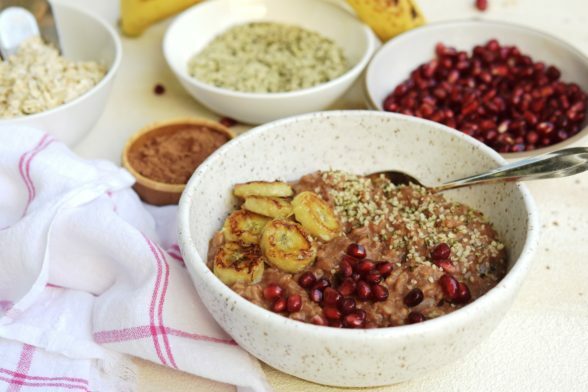 What I love about this recipe is that the bananas melt into the oats and provided enough natural sweetness that I don’t need to add any extra sweetener. Like any recipe, you might feel differently. But try to enjoy it as is and you might start to train your tastebuds to appreciate foods with less sugar. And as a chocoholic, I also like a little cacao in the morning. It gives me a nice natural boost of energy without the jitters from coffee. I do have to be careful about too much cacao, so I limit this to 1 Tablespoon for 2 servings. Again, feel free to add more. What I don’t do is add drizzles of melted chocolate or stir a handful of chocolate chips into my oats. That’s an interesting dessert idea though. For me the key with oats is to add protein and fat, otherwise I will be too hungry mid-morning. I workout in the mornings, so I can handle the carbohydrates. Several people have mentioned to me that they don’t eat carbs because it causes them to gain weight. I can’t comment on that when I don’t know someone and her diet and lifestyle, but oats have a lot of both kinds of fiber, so we’re talking about slow-burning energy, and 1/2 cup of dry oats is in the range of 170 calories. I need at least 400 calories to get me through to lunchtime. It’s the carbs that do not naturally contain fiber and/or protein (aka “simple carbs”) that are the problem. I have mentioned to a few people that you can reduce the oats and water and add some cauliflower rice or minced zucchini to the rolled oats and cook them together. Just a thought! And you don’t only have to make this with oats. 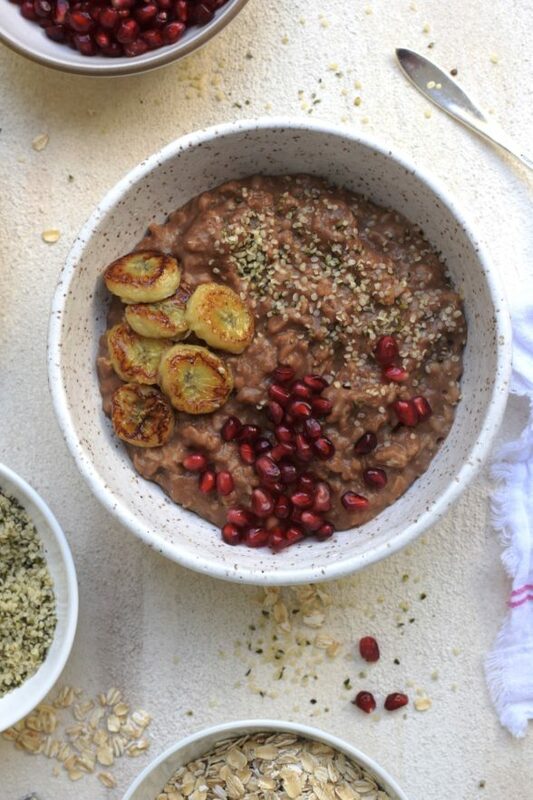 You can make this with quinoa, quinoa flakes, millet, creamy buckwheat or see this post for a DIY gluten-free porridge. I gave myself a couple days off from this oatmeal and I am now craving it again after writing this post! Place the oats, banana pieces, salt, water, cacao powder, and vanilla in a medium saucepan and bring to a boil over high heat. Stay close and do not let the pot overflow. Lower the heat to a simmer and gently cook the oats until tender, stirring occasionally and smashing the banana pieces to break them down. I like my oats pretty soft, so I cook them for about 15 minutes. But if you like them a little chewier, feel free to cook them for less time. Stir in almond milk according to desired consistency. I usually add about ½ cup. Stir oats continuously until almond milk is absorbed and oats are creamy. Add more milk as desired. Top as you wish, but a good drizzle of natural peanut butter is delicious here! Leftovers can be refrigerated for several days and reheated in a saucepan over medium heat with additional almond milk. Leftovers can also be blended into a smoothie with additional almond milk or beverage of choice. Could you or have you ever done this in an instant pot? I have not made regular oats in an Instant Pot because it doesn’t save any time. Remember that it take time for the machine to reach pressure plus cook time plus time to release the pressure. Steel cut oats, including this recipe made with steel cut oats, can be done in less time in the Instant Pot, although I haven’t tried it. Yum! What’s the difference with using the powder? Sounds delicious, I’ve never owned vanilla powder and think it may be great to try out! when do you add the chia seeds / flax seeds please ? You can add them right from the beginning if you want! Going to the kitchen right now to make this super delicious oatmeal you never disappoint me! Love your recipes! It’s freezing Here on Long Island this will warm us up! I made the oatmeal this morning, a perfect way to start a very cold day in New Jersey. It reminded me of the oatmeal my grandmother used to make during the winter. She cooked it with cocoa powder and milk and sometimes added raisins. Thank you for the recipe and also for the memory! It’s amazing how many times food can conjure up a memory. So glad you enjoyed this one, Mia! 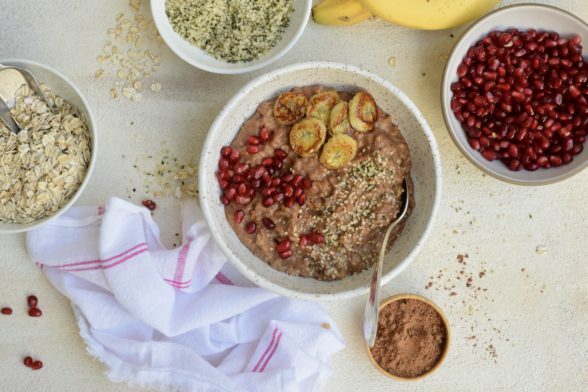 Can this recipe be made as your overnight steel cut oats in the crock pot? Thank you! Absolutely! The bananas will fall apart on their own, so no need to stir or mash while they’re cooking. DELICIOUS!!! Thank you again for sharing the recipe!!! Love this recipe!! It came out creamy and delicious. So perfect for our cold Virginia mornings! Thank you Pamela! Nothing beats a good bowl of oatmeal on a cold morning!